A year before it's slated to launch to go into production, the Nissan e-NV200 takes the Environment Award at the 2012 Fleet World Honours. Nissan's all electric van, the e-NV200, isn't even on the market yet, but it has won its first award. In the prestigious 2012 Fleet World Honors, the e-NV200 was awarded the Environment Award by Van Fleet World Magazine. The e-NV200 is the electric version of Nissan's new NV200 commercial van. Van Fleet World editor, John Kendall, said: "If there are two obvious vehicle types where electric power could make serious inroads, it would have to be in the delivery and commuter vehicle sectors. Nissan flicked the electric switch first with the LEAF and the e-NV200 prototype has adopted the same basic technology and applied it to a delivery vehicle. You can't go out and buy one yet, but Nissan has been conducting trials with FedEx and British Gas, part of the company's global proving test with the vehicle. Range can be extended by rapid charging which can boost the batteries to 80 per cent of full charge in 30 minutes." When it goes to production Nissan expects the e-NV200 to have a driving range similar to the Nissan Leaf, or about 100 miles. The van shown in Detroit had a 48 module battery pack, just as does the Nissan Leaf, meaning it will have a similar electrical capacity (in kilowatt-hours) for a similar driving range. Its' 80 kilowatt electric motor, and 207 foot-lb of torque is also right in line with the Nissan Leaf. The NV200 and e-NV200 was selected to be the New York's Taxi of Tomorrow. This program is an attempt to upgrade New York City's taxicab fleet to ones better suiting the needs of New York's taxi riders. The gas powered NV200 is expected to go into service in 2013, and the all electric e-NV200 is expected to go into service in 2017. Reducing the environmental footprint of NY's taxi fleet is only one of several goals in the program. In the meantime NYC and Nissan have collaborated to make six Nissan Leaf's available to NYC Taxi companies to test the waters of deploying electric vehicles as taxicab's. If a taxicab with a 100 mile driving range doesn't sound workable, we should that the Nissan e-NV200 includes support for the CHADEMO fast charging standard. 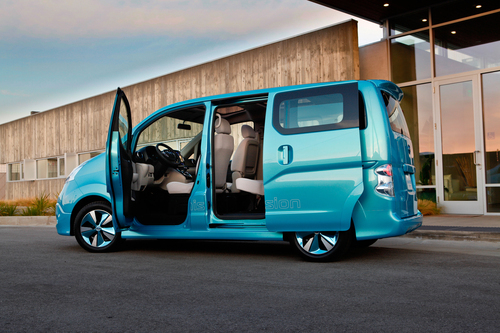 Additionally the e-NV200 website pictures the van alongside Nissan's new low priced CHADEMO fast charging station. Clearly if fast charge stations were to be made available for e-NV200 taxicab's, the driver of a taxi with a depleted battery pack would simply pull into a fast charge station, take a 30 minute pee and coffee break, and quickly get back on the road. The Van Fleet World Honours are presented, by Van Fleet World Magazine, annually to those motor manufacturers, service companies and individuals who have, in the opinion of the judges, achieved the highest possible level of excellence in their sector. It would be great if this Cab had the 100 mile range the LEAF was targeted at - but I would think that a 15 minute quick charge after a 50 mile drive would be a safer plan! Delivery vans - typically follow set routes and are more easily predictable as to what they will be doing, whereas taxi's won't be as predictable! This vehicle looks like it could easily use a Belly mounted battery pack the size and energy capacity of the Tesla Model S - but maybe that is wishful thinking!